Sorry for the extended vacation from my blog. After I got my computer back from the shop we started experiencing internet problems and I haven't been able to post for a while. I will try to catch up and get everyone up to date on what I've been doing during this time away from the computer. The following two paintings were listed on eBay last week between the intermittent internet service and will be ending this week. The first one "Stone Crossing" is done on a 3/4" canvas instead of my usual 1 1/2" box type canvas. This gives the purchaser the option to frame it or leave it unframed. 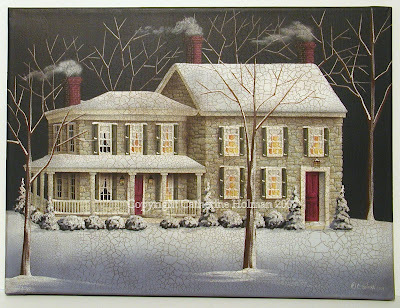 An eggshell crackle and antiquing has been applied to this painting to give the appearance of age. Click on the image for a closer view. Stone Crossing is a quiet haven for Francine and Edward Stewart and their family. Coming home at the end of a day of hard work to a home cooked meal prepared by his wife’s loving hands, is exactly what Edward needs. The family gathers around the long harvest table where hands are joined and heads are bowed as the blessing is asked over the food that is being served. Everyone shares the events of the day and tiny voices giggle as tidbits of meat are handed under the table to Clyde, their English bulldog. The stress that comes with Edward’s job at his office begins to drift away and melt like the snow that gently falls outside. 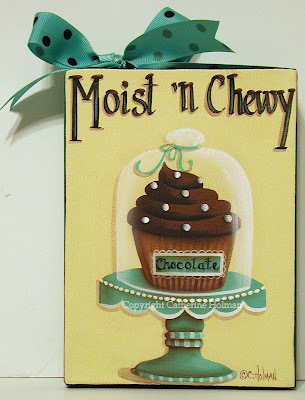 The next painting, "Moist 'n Chewy", is another cupcake painting and will be ending February 24th. Dark chocolate frosting is swirled and piled high on a moist 'n chewy chocolate cupcake. A turquoise cake stand and glass cloche cover make a decorative display for this delectable dessert. A decorative tag on the side of the cupcake liner lets you know what the choice is. The black lettering at the top of the picture is dripping with chocolate icing. A turquoise ribbon with brown polka dots is wrapped around the edges of the canvas and tied in a bow at the top. I also did a little makeover project this week. I posted a photo of the before picture a while back and here it is again. Stone Crossing is wonderful! I love all of your winter scenes but this big old house really is beautiful! And yes, I had a hope chest and still keep all my precious things in a cedar chest. Yours looks very nice with the lighter paint and fabric! You did a great job! Stone Crossing is wonderful! And yes, I had a hope chest and still keep all my precious things in a cedar chest. You did a great job on yours! I love it! Never had a hope chest, but my cousin did and I was jealous. Yours turned out so beautifully! Very nicely done. I'm sorry that you've been having internet troubles. (So have I as far as email goes and it's no fun.) Here's to everybody getting up and at'em soon! I love the Stone Crossing painting. The crackle finish looks fantastic! Great job on the makeover, it looks brand new! First time over your wonderful blog! I`m mesmerized by your T.A.L.E.N.T! First, I love your new painting with the crackle technique. Second, your hope chest looks beautiful in white with the silver tapestry. Third, My mother started a tradition with my older sister and she purchased a hope chest on her 16th birthday. However, when I reached 16, I was a Non Martha Stewart tomboy and asked for something else. I kind of nipped the tradition in the bud. It was more like a one time event in our family. My sister used it for her keepsakes. I hope your internet troubles are fixed. Catherine, you have out done yourself with Stone Crossing-it is absolutely gorgeous!! I love the cupcake painting too! Your hope chest turned out wonderful! I don't know if they still have hope chests, I always wanted one but never had one. You think my father, who was a builder, would have made me one. Oh well! Very nice paintings, yes I received a hope chest when I was 16 and then gave it to my daughter when she turn 16. Love the new look!! Yes, I had a hope chest that was passed down from my great-grandmother but it was never big enough to hold all the things I was saving for when I got married. So it spilled over into boxes. I love how you gave yours a facelift. It looks beautiful! 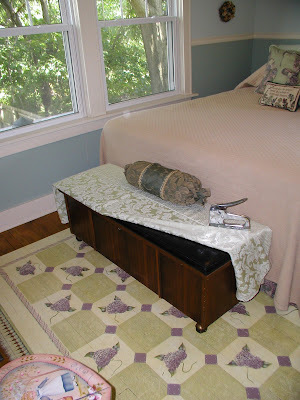 And I always love seeing photos of your lilac "rug" (one of my favorite pieces you've ever done). 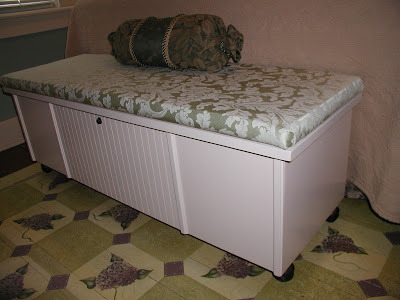 Cathie, your Hope Chest looks wonderful! Yes, I too have a Hope Chest but I actually received mine as a gift from my husband after we were married. I love the scent of the cedar inside the chest. Perhaps I'll take a picture of it sometime and post it on my blog. That might be a fun challenge for all of us with hope chests. I love the makeover of your hope chest. I had a hope chest. I'm not sure girls do these nowadays. Of course your paintings are wonderful!! I love what you did with your hope-chest! Love the update on the chest. My daughter was married 12 years ago and had a hope chest. Seems to be a thing of the past for most girls, but I think it's still a lovely idea. oh my... stone crossing is absolutely gorgeous! the details on the stones are ...man... i can't even describe it! i love it! I've been watching your blog for a few months and honestly I am in awe of your paintings and your little stories...You have inspired me get out my beloved paints and brushes and "see if I've still got it". I love your dessert series also, they're gorgeous. Your hope chest is very nice...I love tutorials like this. Thanks for sharing your wonderful paintings with us. I am so glad I found your blog! You do such beautiful work! I want all of your paintings! I love your hope chest makeover. It looks great. I got a hope chest (many years ago) and still have it. As usual, your paintings are fabulous. I'm thinking of doing a bench at the end of the bed too. Love your re-do! Catherine, Stone Crossing is just a stunning painting...great work. You know I love your cupcakes as well.